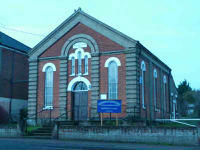 Founded in 1877 Halesworth Methodist Church has faithfully served the community but due to a reducing membership has now reluctantly closed for worship and fellowship. Members have transferred their allegience to Wenhaston Methodist Church. Information about the location and programme of Wenhaston church are available on its page of this website.